"Hi Susan: A quick question if I may- with an open log cabin kitchen, wood floors, and a wood ceiling with beams, what color cabinets would you suggest? The wood is a light color on the walls and ceiling. Thank you, Patty"
First, I never see ONE answer to a question like this. Instead, I prefer to drive my clients crazy with six (or more) additional questions of my own to help them get focused! The method to my madness is as follows and represents off the top of my head questions as a response to this "quick" question. The wood may be light, but how much light is there in the kitchen, either via windows or lighting? Could the room use help with reflected light from a large block of (light) cabinetry? What are the colors/theme in the surrounding rooms? Is there any trend of wood finishes or colors that you will be seeing that you may want to blend or coordinate with, in the kitchen? Do you like contrast or do you prefer colors to be soft and flow within the space? If you are interested in, say, an opaque white, are you aware that, especially if children are in the picture, your cabinetry will look worn far more quickly than if you had other colors/finishes? Are you going after a certain theme? Tailored, rustic, formal, modern, transitional, zen, other? That could give you a clue. 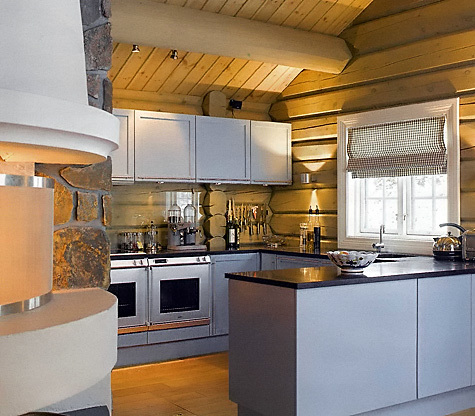 Do you want to contrast the rustic framework of your log cabin with another theme to create an eclectic look? Perfectly acceptable. Note your other furnishings as a guide. Could you be open to alternative colors that you normally do not see such as a soft khaki, an oyster grey, grey/blue, a light mushroom color, sort of a cool/warm soft contrast? Speaking of cool/warm, be aware of this color differentiation in the context of the overall color scheme as well as what's happening beyond the kitchen. You also may want to consider what finishes you want your countertops and appliances to be. These choices will also send a message about the total look of the kitchen. Likewise, the backsplash to a lesser extent. What size is the room? Color/finish of cabinetry plays a role in space perception along with my first item to consider, above, lighting. I feel if the room is small but very well lit (very) perhaps with a light countertop and walls, then dark tones in the cabinetry are fine to use. Of course, a mix of light shades in a small room will allow the space to flow and not appear choppy/busy, something to seriously consider in a small space (choppy/busy). So, unfortunately, I have no answer for you, only additional questions which should definitely put you on the path to focus and insight! Only you know these answers and it should take a little time to consider the various issues involved in selecting just ONE finish. No pressure or anything! I just can't make the decision for you.